I am working with a number of teachers to support the integration of technology into a Project Based Learning environment. As the Principal time is of the essence. I have blocked out two periods a week to work with a group of 13 students in grades 5 and 6 to support their learning on ancient civilizations. We have a fundamental question: What civilization provided the best innovations that impact our current civilization. The teachers started by using the work of Garfield Gini-Newman on critical thinking. Below I have included a letter to parents that I wrote in order to invite them to participate with their child. I am working closely with Mrs. Mundy, Mrs. Deters and Mrs. Chartier to help support your child’s learning in social studies, science and literacy. Specifically I am working on incorporating the use of web 2.0 tools to track, engage and record our learning. Web 2.0 is the term that is being used by educators all over the globe to describe the use of the internet to create content and place it in the public forum for use, manipulation and creation. In other words it is a creative process for showing your learning that others can use to show their learning. It is my intention to work with your child on learning the important lessons of safety, ethics and etiquette in this ever changing learning environment. For example, our first lesson was: “If we wouldn’t say it in the classroom, we won’t say it on Web 2.0” There are many lessons and learning opportunities that will arise from our work in this environment. It is my intention to help protect our children by teaching them with the tools instead of assuming they are protected by banning the tools for learning. If you don’t already please follow the many web 2.0 elements of school life at Eastwood. We have many blogs, a Facebook account, Twitter feeds, Audioboo account and Youtube Account. These accounts will connect to the work your child is doing and is a way for you to share in the learning. I am going to host a parent night in May so stay tuned. 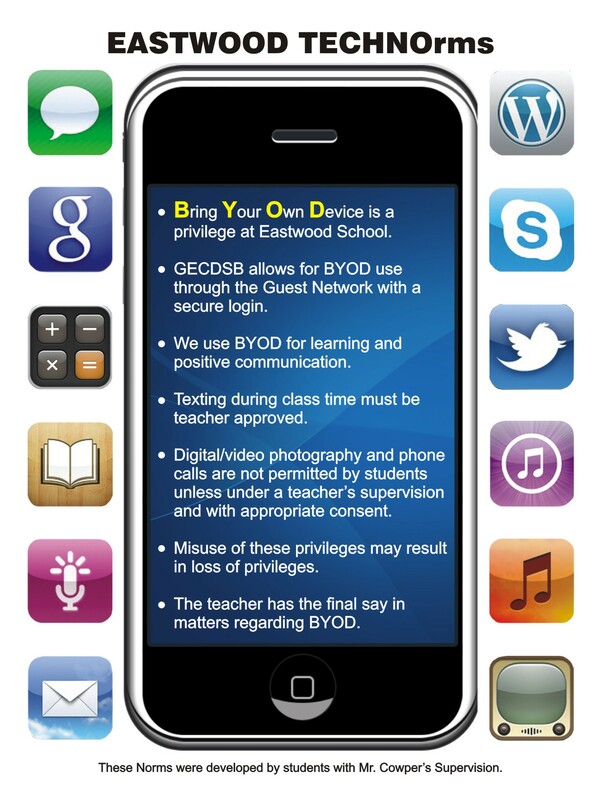 I also included this poster, that hangs in all classrooms, to illustrate our work with students to understand the role that BYOD plays in our student learning.